We’ve just finished studying Jonah in the small group I’m co-leading. I really enjoyed its complexity. Some thoughts! Yes, all the time. We can do precisely the opposite of what we know he wants us to do, in small things, like diet, discipline, or in global matters. And can we get away with it? Ummm, yes. Yes, we can go our whole lives doing the precise opposite of what God wants us to do, and may be wealthy, healthy and successful. There will be consequences, but these may not be apparent. We will however not have the jewels of the spiritual life—peace, joy, shalom, though we many have earthly jewels. It was “the severe mercy” of God that provided Jonah a chance to repent! So Jonah’s in the belly of the whale? What turns things around? He prays to the Lord with utter faith, and astonishingly, he prays in the future tense, as if what he has prayed for has already happened. Jonah responds this time. He proclaims, “Forty more days, and Nineveh will be destroyed.” Surely the shortest sermon ever preached. It elicits a disproportionate response. When we have sinned and disobeyed God, there is always this way of re-entering the force field of God’s blessing—we fast, we pray, and we repent, and stop those sinful actions. But Nineveh has more than a hundred and twenty thousand people who cannot tell their right hand from their left, and many cattle as well. Should I not be concerned about that great city?” Jonah 4:10. God gives us many chances, but perhaps not infinite chances. The story moves on. If we reject God’s invitations too often, his loving story goes on, but with us outside it. God justifies his actions, but as far as we know, Jonah does not repent. His gift was to be a prophet, one who heard God’s voice. His former prophecies, about the restoration of Israel’s former borders, 2 Kings 14:25, had been fulfilled. But we never hear about Jonah again. He is furious with God, with God’s ways, with God’s mercy, and if the word of the Lord ever comes to him again, we never hear of it. It reminds me of Elijah in 1 Kings 19, who has finally had enough, as he tells us. 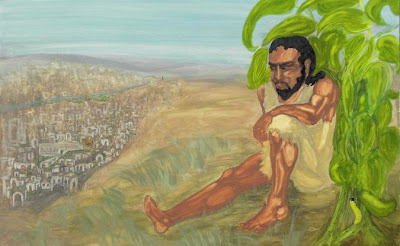 God asks him the same question twice, “What are you doing here, Elijah?” and when he receives the same answer—after the display of God’s power: the wind, the earthquake, the fire, the whisper, which suggests that Elijah was not really listening or receptive to God’s voice, or “getting it” as prophets must—God moves on, he commissions Elisha. God’s story continues, but Elijah’s role in it is over. God is incorrigibly merciful and often shows mercy to the undeserving. Sulking leaves us out of his continuing story of mercy and love. Jonah amusingly tells God off for his mercy. “Isn’t this what I said, Lord, when I was still at home? That is what I tried to forestall by fleeing to Tarshish. I knew that you are a gracious and compassionate God, slow to anger and abounding in love, a God who relents from sending calamity. Sulking that God is slow to anger, not executing judgement on those we think he should, cuts us off from the flow of God’s love, mercy and compassion, and we are the losers. The elder brother in the parable of the Prodigal Son refuses to enter the house of dancing, music and the fatted calf. Similarly, Jonah cannot accept God’s goodness, and reproaches God. While the younger son and the people of Nineveh rejoice, the good son, and the prophet of God are outside in the fields, outside the happy city, sulking at God’s mercy to the undeserving. We need to continue forgiving to be in God’s story of goodness and answered prayer (Mk 11:25) and to accept that is a God of mercy and compassion to us, just as much as to those we think are less deserving.